Confirmed Lineups: QPR Vs Manchester United Below are the confirmed lineups of Queens Park Rangers and Manchester United. Manchester United will face Queens Park Rangers about in half an hour in a Premier League game. 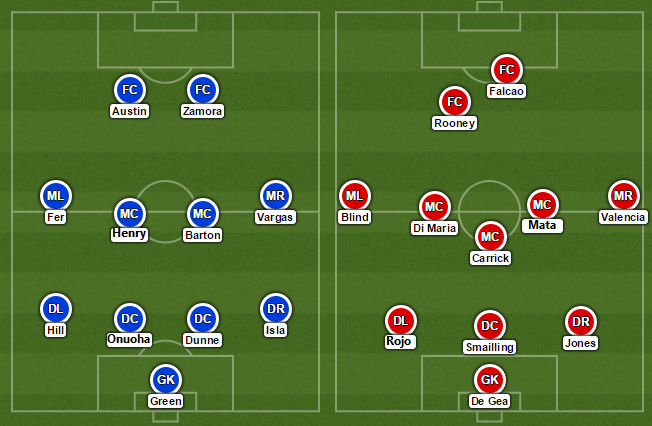 Below are the confirmed lineups of Queens Park Rangers and Manchester United. Manchester United boss Louis van Gaal has just made a change, bringing Marcos Rojo in place of Luke Shaw while the rest of the players continues same as of last game against Southampton. David de Gea continues on goal with Phil Jones (left side), Chris Smalling (centre) and Marcos Rojo (right side) in the defence. Antonia Valencia who was the star performer last weekend of United starts on the same right wing back role. Michael Carrick takes a deeper role asusual with the support of Juan Mata and Angel di Maria. Daley Blind moves to a left wing back position from his last weekend’s defensive role. While the duty in front of goals will be carried by skipper Wayne Rooney and Radamel Falcao. Substitutes: Victor Valdes, Jonny Evans, Paddy McNair, Adnan Januzaj, Ander Herrera, Marouane Fellaini, James Wilson. Fellaini returns from injury and gets the bench while Robin van Persie is out with an injury. Prediction: QPR 0 – 2 Manchester United, Falcao and Di Maria on the score sheet. Predict your score with goal scorers below.